Erwin resident Don Dutton called me recently to ask about hummingbirds. He hasn’t seen many this past summer season, but as I told him, their numbers fluctuate from year to year. 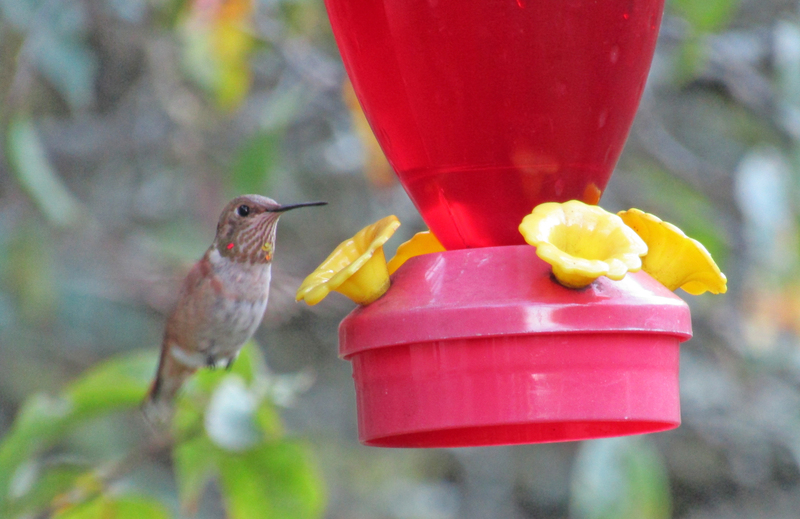 Most of the ruby-throated hummingbirds have now departed the region. I did encourage him to keep his sugar water feeders hanging as fall gets closer to the colder weather of winter. You never know when a rufous hummingbird or other western species might stray into Northeast Tennessee. Photo by Bryan Stevens A young male Rufous Hummingbird at my feeder in Hampton, Tennessee, on Oct. 13. In fact, I’ve been visited twice since the first of October by a young male rufous hummingbird. It’s easy to tell the rufous from the ruby-throated hummingbird. The rufous shows a great deal of brown/rufous coloration in its plumage. The bird at my feeders visited on Oct. 7 and again on Oct. 13. I’m very hopeful the bird will linger for a spell. I am asking anyone who sees a hummingbird in the coming weeks to let me know by sending an email to ahoodedwarbler@aol.com. Photo by U.S. Fish and Wildlife Service/George Gentry An evening grosbeak, the largest of the winter finches that stage occasional irruptions southward in search of food, visits a feeder. Could this be the year these colorful birds return to the Southern Appalachians? With October already halfway completed, it’s time to stop lamenting the end of summer and brace for another winter. The cold season brings an entirely new range of birds to the region for our viewing enjoyment. If nothing else, winter birds provide a tremendous morale boost to help us overcome the occasional gloom of the winter season. There’s nothing quite as entertaining as watching a large, boisterous flock of birds like evening grosbeaks or pine siskins at your feeders. So, some of our favorite summer birds have flown south. We’ll miss them, but we will see them again next spring. In the meantime, winter offers its own bird diversity. Here are some of the types of birds to enjoy as the weather outdoors becomes colder. Ducks and other waterfowl. The U.S. Fish and Wildlife Service conducts yearly surveys of the breeding success of native ducks. In cooperation with the Canadian Wildlife Service, this year’s survey has some mixed news for those birders eager to observe ducks later this fall and in the winter at area lakes, rivers and ponds. Im love to check the pond at Erwin Fishery Park and the ponds along the linear trail for visiting waterfowl once the weather turns colder. The figures from the report came from surveys conducted in May and early June. Overall duck numbers in the survey area are statistically similar to last year and remain steady. Total populations were estimated at 48.4 million breeding ducks in the traditional survey area, which is 38 percent above the 1955-2015 long-term average. 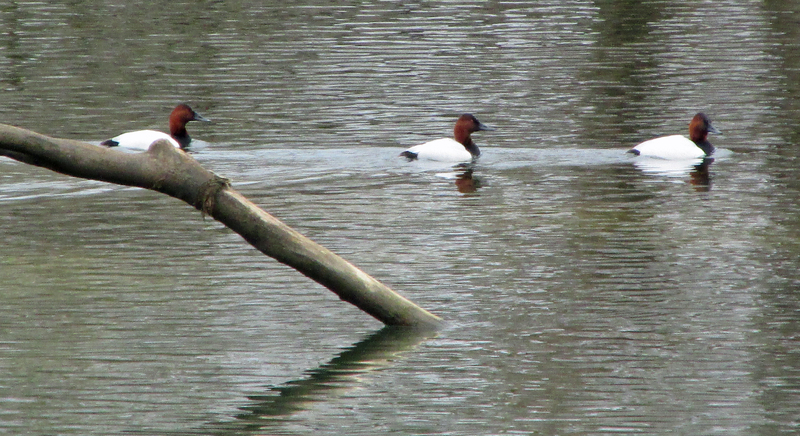 Photo by Bryan Stevens A trio of Canvasbacks on the Watauga River in Elizabethton, Tennessee. Last year’s estimate was 49.5 million birds. The projected mallard fall flight index is 13.5 million birds, similar to the 2015 estimate of 13.8 million. American wigeon, green-winged teal and redhead are two ducks that are expected to show an increase in numbers. Unfortunately, some other species showed declines, including Northern shoveler and canvasback. Photo by Bryan Stevens Northern finches, such as this Pine Siskin, may come south in large numbers. Other waterfowl that could join the annual migration of ducks include everything from loons and grebes to geese and cormorants. Northern finches. Reports from the Northeastern United States indicate that the cone crop — a vital food source for a variety of songbirds —has been extremely poor. Reports from Canada indicate more of the same, which could result in a variety of the so-called Northern finches — pine siskin, common redpoll, purple finch, red crossbill, white-winged crossbill and evening grosbeak — heading south in massive numbers as they seek out alternative food sources. 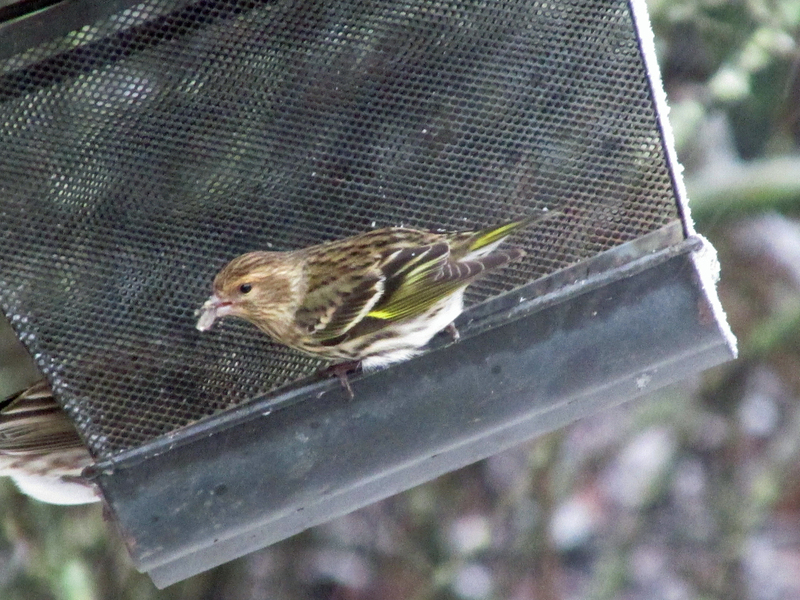 I’d be thrilled to see flocks of common redpolls or evening grosbeaks at my feeders, although the more likely visitors are probably pine siskins and purple finches. 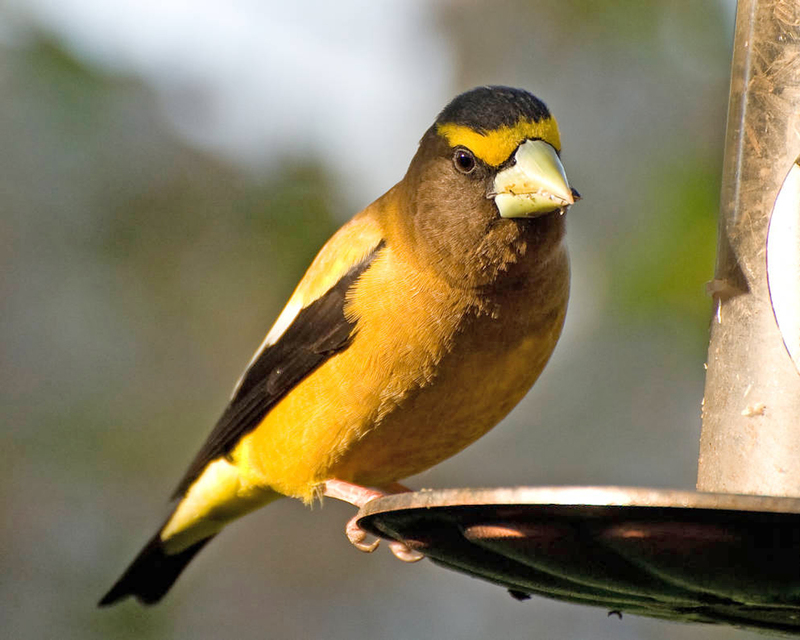 I haven’t hosted evening grosbeaks at my feeders since the late 1990s. In fact, I haven’t seen an evening grosbeak since 2000. Perhaps this will be the year these large, colorful and energetic finches overwhelm our feeders once again. The coming winter could be a very interesting one for birders. Keep your eyes open and your binoculars handy. Sparrows. Although we have a few sparrows in our yards and gardens during the spring and summer, this group of birds often referred to as LBBs, or Little Brown Birds, really comes into its own during the winter season. Many of the sparrows prefer yards offering dense cover, such as hedges, brush piles or evergreen trees. Photo by Bryan Stevens Red-breasted Nuthatches are already showing up at feeders throughout the Southern Appalachians. If you enjoy a challenge, set yourself the task of learning the subtle differences between some of our native sparrows. Nuthatches and woodpeckers. Although the woodpeckers are present throughout the year, it’s often easier to observe these “tree-huggers” once the leaves are off the trees. A couple of species, including the red-breasted nuthatch, red-headed woodpecker and yellow-bellied sapsucker, are migratory birds with numbers that fluctuate from year to year. I’m learning about reports that elevated numbers of red-breasted nuthatches are already winging their way south. 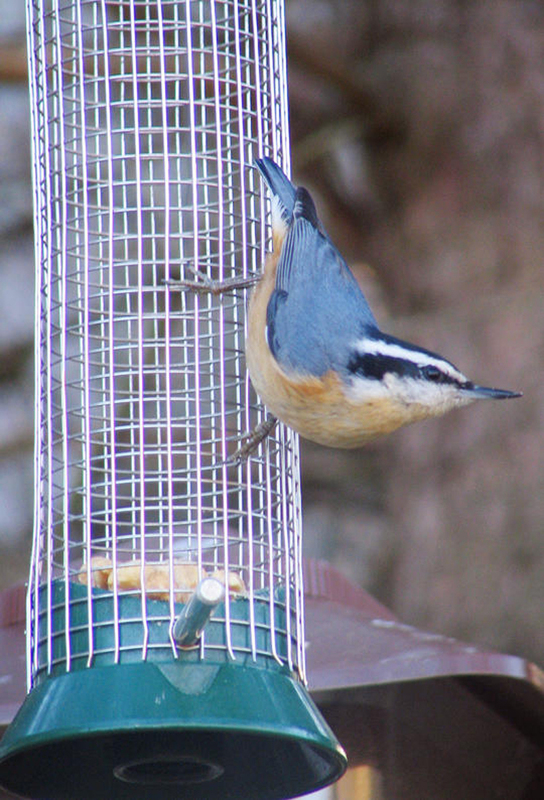 These tiny birds with their “yank, yank” calls are immensely entertaining at feeders. They love sunflower seeds and peanuts, so make sure you have plenty of their favorites ready and waiting for them. This entry was posted in Birding, Birds, Northern finches, Winter birds and tagged Birding, birds, Bristol Herald Courier, Bryan Stevens, Carter County Compass, Elizabethton Star, Erwin Record, Fall migrants, Feathered Friends, McDowell News, Our Fine Feathered Friends, The Erwin Record, Winter birds, Woodpeckers on October 23, 2016 by Bryan Stevens.